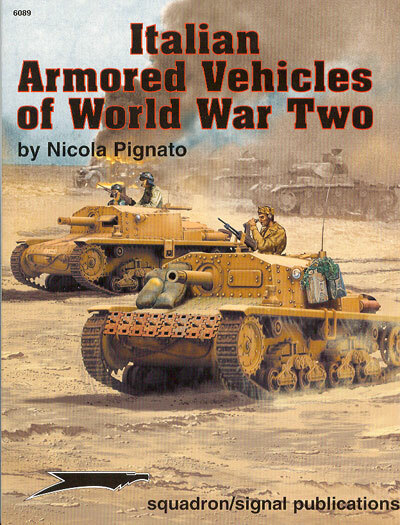 Title and Publisher: Italian Armored Vehicles of World War Two by Nicola Pignato. Advantages: Great coverage of a variety of vehicles; comprehensive photos with useful captions; specifications and brief histories included. Squadron/Signal's new title "Italian Armored Vehicles of World War Two" is a much-needed reference and a great starting point for anybody interested in Italian armour. The book includes inspirational artwork that will get you fired up to build that M13/40 or Semovente gathering dust in your collection. In addition to some of the more commonly known Italian armoured vehicles, the book also covers the L3-33 & L3-35, L6-40, 47/32, M11-39, M13-40 and M14-41, Semovente 75/18, 75/32 and Command Vehicle; Semovente 90/53, M15/42, Semovente 75/34 and 105/25, P-40 (armoured cars) Autoblindo AB 40, 41 & 43, Lince Autocarro Protetto AS 37 APC, Sahariana, an armoured rail car and a few other oddities. The book is structured to include a brief introduction and history of each vehicle, including specification tables, badge detail, markings and camouflage with FS number approximations. The only only disappointment is the lack of scale drawings. A few more detail and interior photos or drawings might also have been useful. Hopefully in a second volume? This is a great introduction to the subject and will be welcomed by Italian armour fans.